Points were accumulating by running between two of four specially marked phoneboxes in each postcode, the phoneboxes acting as timers for the runs. The final person to start (and finish) in each postcode won an “eclipse” prize, while certain phoneboxes were designated as “lunar” at a certain point in the competition, the first person running from such a phonebox winning a lunar prize. More on Christine’s racing can be read in this article. Ed Catmur was notable as the first person in the entire game to run in all 48 postcodes, while Verity Vale was the first woman to do so. 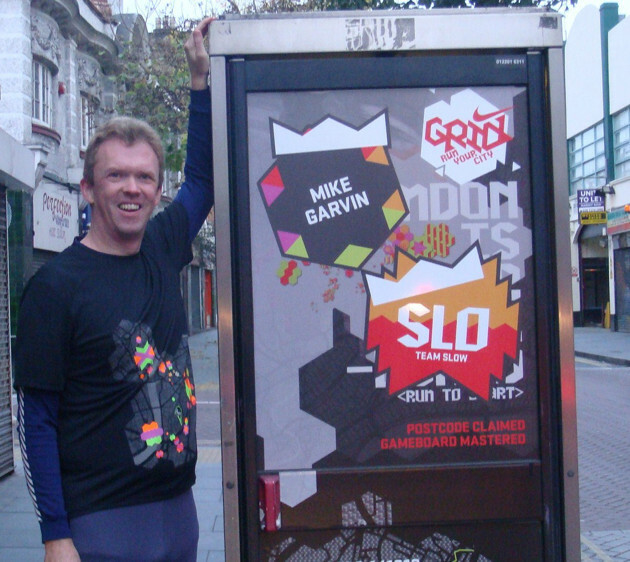 Another notable individual achievement was Dan Findlay Robinson’s eleven-hour epic run, the bulk of which was spent shuttling between two phoneboxes in E1 to secure that postcode early in the game. Lunar, Eclipse and probably Player Crown winners all win £100 running shoes, representing a prize haul of over £2000 for the club! ** Non-SLOW members but part of More Team SLOW during the competition. Top: Phil. 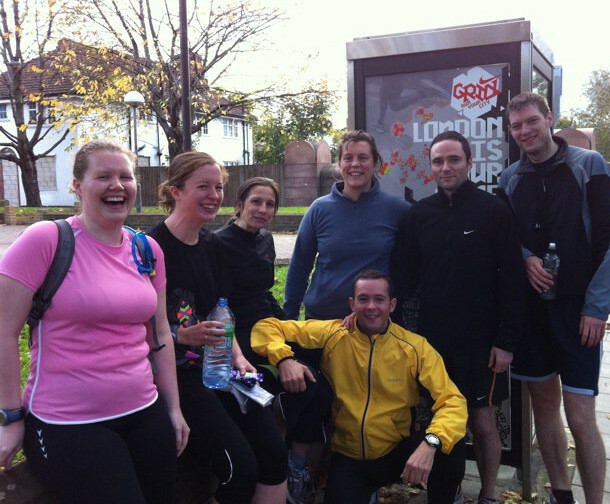 Above: Photo of the final-day clash in SE16 between More Team SLOW and Team Audiofuel. Below: Mike.